The already surreal public spat between QMI boss Pierre Karl Peladeau and former PMO wunderkind Patrick Muttart took another strange twist Wednesday night, as Muttart’s PR firm responded to PKP’s essay accusing him (Muttart) of pushing a fake Michael Ignatieff photo. 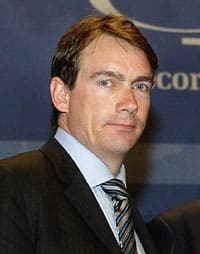 Readers of the Sun papers woke up to an essay Wednesday by Pierre Karl Peladeau, president Sun Media Corporation, denouncing a former aide to Stephen Harper for campaign dirty tricks at his company’s expense. Peladeau accused Patrick Muttart, once Harper’s deputy chief of staff, of trying to peddle the Sun a bogus photo of Liberal leader Michael Ignatieff dressed in combat gear. The picture shows a group of soldiers in front of a military helicopter, holding automatic rifles, purportedly in Kuwait prior to the 2003 U.S. invasion of Iraq. One of them, supposedly, was Michael Ignatieff, who was then an academic at Harvard. Peladeau says Muttart passed the picture onto the Sun’s Kory Teneycke, who is also ex of Harper’s PMO. Only when Teneycke pressed for a higher-resolution copy of the photo did it become clear that Ignatieff wasn’t actually in the photo, Peladeau wrote. “[I]t is the ultimate source of this material that is profoundly troubling to me, my colleagues and, I think, should be of concern to all Canadians,” Peladeau wrote. The Tories claimed that it had warned the Sun it had tried but couldn’t verify the identity of the subject of the photo. The campaign also denied that Muttart was working in the party’s war room. “He has however done some paid consulting work for the campaign. Patrick has no further role in the campaign,” the party said in a prepared statement. Initially, Patrick Muttart provided Sun Media with multi-point verbal overviews concerning Michael Ignatieff and the War in Iraq. Later, he provided additional material at Sun Media’s request. Sun Media used much of the information he provided. At no point did Muttart tell Sun Media that he had positively identified Ignatieff in the photo in question. And at no time did Muttart mislead, or intend to mislead Sun Media, in his provision of information to them. For the record, Mercury was hired by Quebecor to assist Sun News with its pre-license branding and positioning. Muttart worked with a creative agency to develop the network’s original logo (a modified version is currently in use). And he was the original source for the network’s “hard news” and “straight talk” framing language. Even after Mercury’s engagement with Sun News came to an end, Muttart was asked for and provided pro bono feedback on the network’s graphics and on-air promotional spots. Muttart was so committed to the success of Sun News he proactively reached out to a number of current, former and prospective clients about advertising on Sun News and facilitated a number of introductions. Again, he did this pro bono as a supporter of Sun News. So, Muttart, or his firm, are hired to brand and position the new Sun News Network. Then, sometime later, we presume, Muttart is hired on contract — possibly through Mercury, though that’s not clear — to work for the Conservative campaign. It is in this capacity that he passes on the photograph and other information about Ignatieff’s alleged Iraq war planning to Kory Teneycke. The entire thing is beginning to look like a Max Escher print. And it appears to weaken Peladeau’s claim of independence from the CPC campaign, when the same consultant who crafted his new network’s branding is also doing similar work the Conservatives and passing his work product back to Sun TV. BONUS POINTS: What Peladeau did not address in his essay was that his papers and new TV channel continued to report that Ignatieff was on the “front lines” of planning the Iraq invasion, nevertheless. The evidence? Ignatieff had in 2002 attended conferences at Harvard on limiting civilian casualties. The U.S. military participated in these conferences, as the Sun noted, but so too did numerous humanitarian non-governmental organizations such as Amnesty International and Human Rights Watch. That exculpatory detail was omitted from the Sun report. The Peladeau editorial did, however, shine a light on the cozy relationship between campaign war rooms and journalists who, always looking for a story during an election, can be a receptive audience for nuggets dug up by party researchers. One other interesting fact to emerge from the entire imbroglio was that Muttart, once considered a strategic genius in PMO, was being paid as consultant. Muttart is on the masthead of Chicago branch of Mercury Public Affairs (per above). Opposition parties have long suspected that the Tories use U.S.-based and (likely) Republican Party-affiliated political consultants to develop campaign strategy. But determining which consultants are on the payroll is difficult. Filings with Elections Canada list total amounts for “professional services” and do not detail who was paid from the campaign accounts or how much. The data do show the Tories spent considerable more on these professional services than other parties in the 2008 election campaign: $1.8 million to the Liberals’ 350,000 and the NDP’s $53,000. I just assumed the whole point to the Sun’s statement about the fake photo was an attempt to keep this non-story in the news to connect Ignatieff to Iraq and try to drive some votes from Liberals to the NDP. Nothing Muttart has has said, including his bizarre charge, conflicts with my assumption that all of them, Harper, CPC, Muttart, Sun, just want to try to keep this story in the news as long as possible even though they have no leads or info to go on.